The vastness of space fascinates almost everyone as a child. In fact, a lot of kids dream of being an astronaut and flying spaceships. Why then do so few of them end up pursuing astronomy? Perhaps as we grow up, we perceive astronomy as something unattainable, something that a few white-bearded men do in obscure places. There is a need to break this enigma around the hi-tech science by organizing dedicated outreach events. Earlier this year, the president of Astronomical Society of India (ASI), Prof. S K Pandey, had emphasised the need to boost astronomy education and outreach in the annual meeting of ASI. 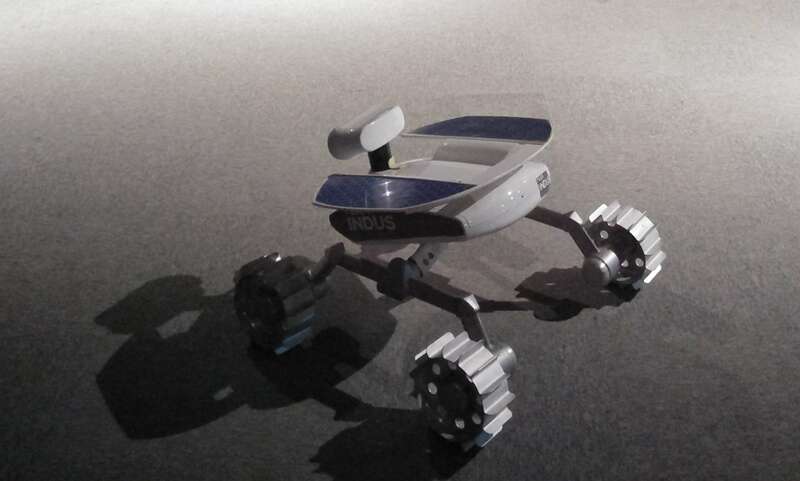 TeamIndus, private aerospace company, popular for being India’s only contestant in Google’s Lunar X Prize, is trying to break this barrier and expose interested kids to space through its outreach arm. A latest survey by the International Astronomical Union (IAU) has shown that the ratio of female to male astronomy researchers in India is 9%. This is much lower than the dismal global average of 16%. Clearly, active measures are needed to set the gender imbalance right in astronomical sciences. One of the activities of TeamIndus, GirlsInSTEM, is a workshop tailored for IX and X standard girls, conducted in collaboration with the Parikrma Foundation School. The school has four branches and supports children from orphanages and slums in Bangalore. GirlsInSTEM was a two-day event held at the TeamIndus campus in Bangalore. It started with a visit to their facilities – where the key attractions were the spacecraft which won the Google Lunar X milestone prize for it’s landing technology in 2015, the moon rover equipped with sensors and cameras and the simulated moon surface used for testing the rover. Since more such events are in the pipeline, TeamIndus is learning and incorporating changes as they move forward. Detailed feedback is taken from the participants after each workshop. Nilu said, “The post assessments are very useful. For example, in the first session, we shared a lot about the moon mission, but our assessment showed that they couldn’t absorb so much. Also, concepts like centre of gravity are difficult to explain theoretically compared to when demonstrated. We have thus planned shorter and more engaging sessions with lots of hand-on activities.” The foundation organises outreach events targeted at varied age groups, from school kids to engineers. The programme design is tweaked accordingly to maximize the learning process. Though the Google Lunar X competition ended with no winners, TeamIndus has no intentions to abandon their mission. Their spacecraft with its rover is scheduled to fly in 2019. Until then, the team is busy building and optimising their model. Side-by-side, they have committed to the task of spreading the excitement and passion of doing science amongst the youngsters through their outreach events. Efforts of TeamIndus needs to b lauded and they should continue their program for encouraging youngsters…. Article has been very well written with required focus on female astronomy researchers…..